MP-8/MP-1-SCP-2 Chrome Color: Chrome Features: -33 Quart container stores up to 25 lbs. -12 Quart container stores up to 10 lbs. -Great for dog food, cat kibble and bird food. -Set includes a 25-pound airtight container, 10-pound airtight treat/travel container and a 2 cup food scoop. -Keeps food fresh and pests out. Country of Manufacture: -United States. Product Type: -Food storage container. Set Size: -4. Dimensions: -Container bottom height: 13.25″. Overall Height – Top to Bottom: -18.6″. Overall Height – Top to Bottom: -17.1″. Overall Width – Side to Side: -10.8″. Overall Depth – Front to Back: -16.5″. Overall Product Weight: -4.656 lbs. 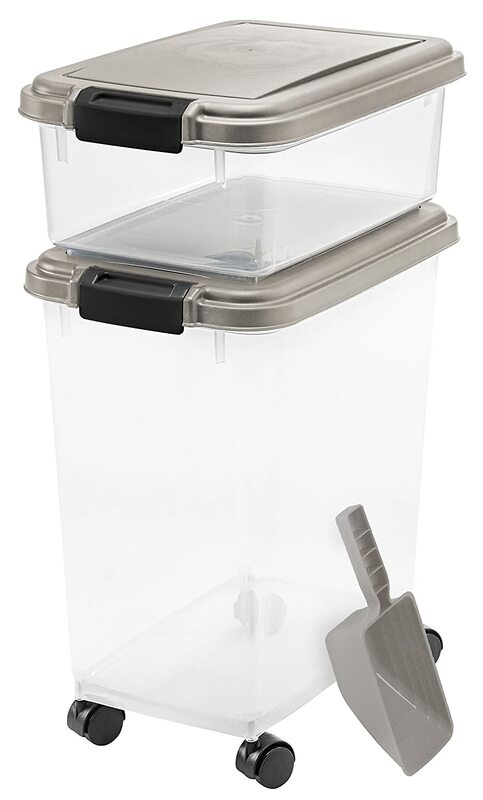 12 QT storage container stacks on the 33 QT storage container, and included scoop makes measuring food easy.